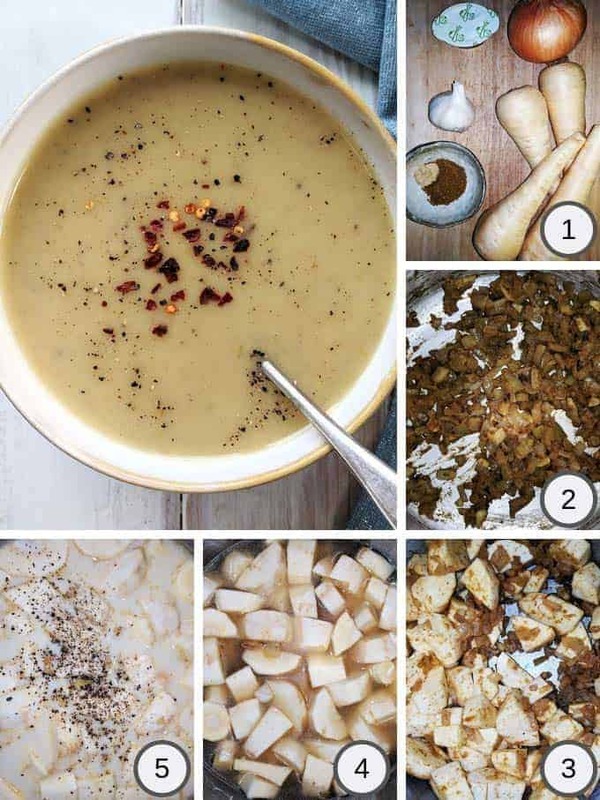 This Spicy Parsnip Soup is a filling and healthy bowl of comfort that is 4 SmartPoints per bowl on Weight Watchers Freestyle plan. 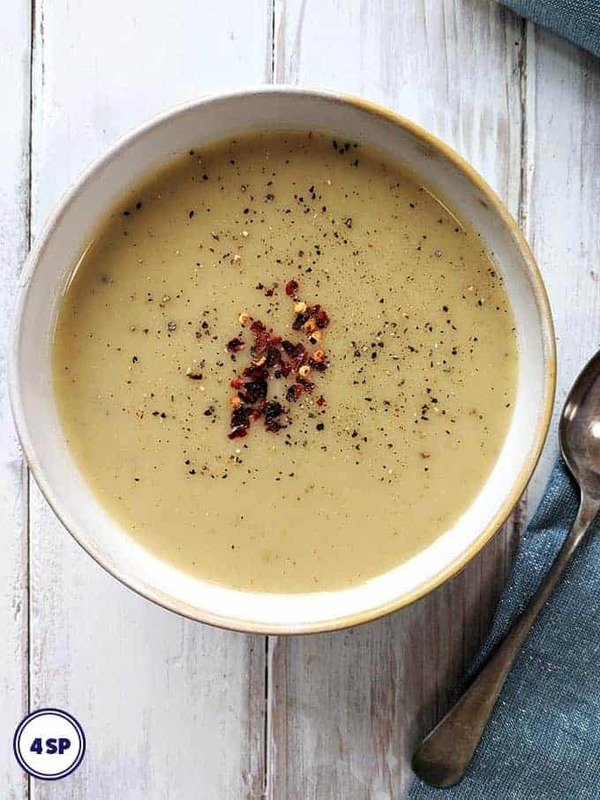 This wonderfully tasty soup is adapted from a Jamie Oliver recipe to make it more Weight Watchers friendly. It has less Points than Jamie’s version but still packs the flavours! I’m on a bit of a soup mission at the moment! Having been so close to my goal weight for months now, I am determined to get there over the next few weeks. So that means soup, soup and more soup! This last week my lunches have included this Carrot and Coriander Soup, this Pea Soup and this Creamy Tomato Soup. Unfortunately, parsnips are not free on the WW Freestyle plan but they are a great vegetable, high in fibre and very rich in potassium. 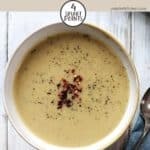 So, although this Spicy Parsnip Soup may be more SmartPoints per portion than a lot of the other soups on this site, it’s good for you and is sooooo worth it in the taste stakes! And did I mention, its very, very filling. Which means that I didn’t need to serve it with bread. 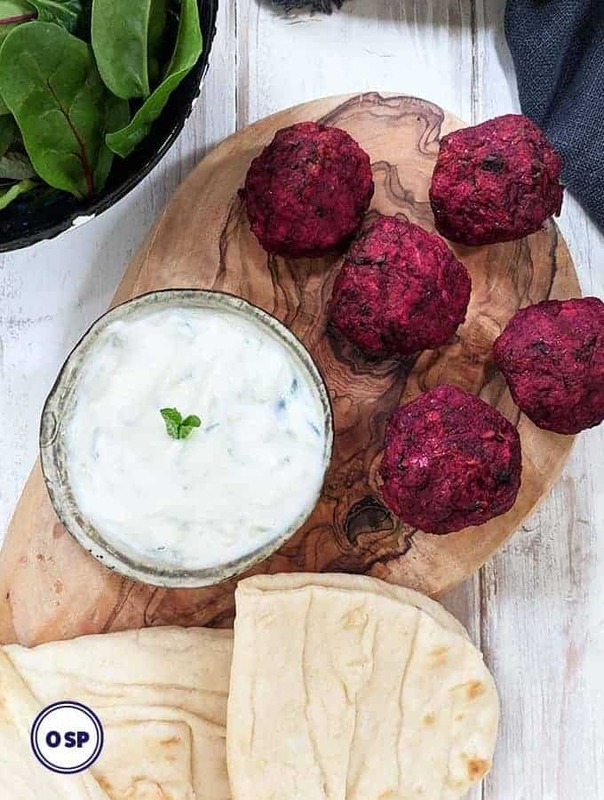 A 4 SmartPoint lunch that is filling and delicious – result! 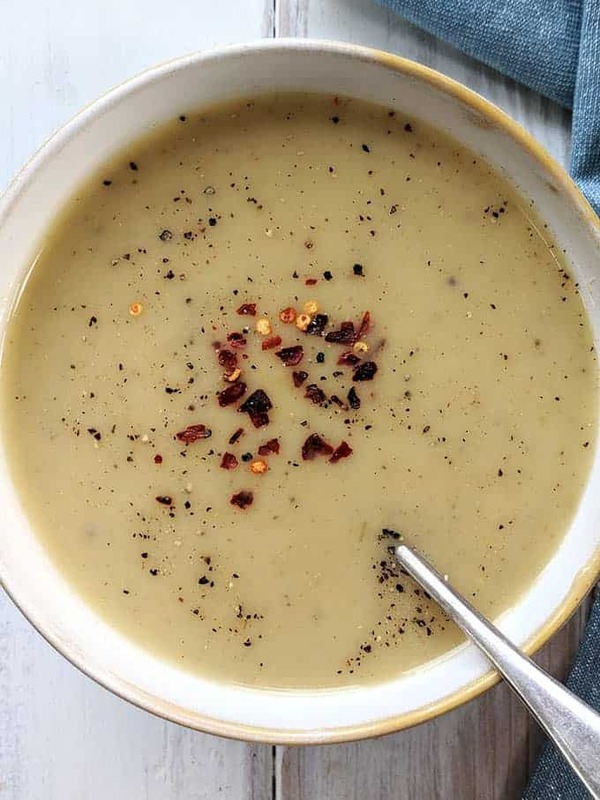 If you wanted to serve this soup with a slice or two bread, you may be interested in this list of Low Point Breads (or if you are in the UK, Low SmartPoint Breads). I sauteed the onions, garlic and garam masala in a little oil (pic 2) until the onions had softened nicely and the mixture was smelling delicious. 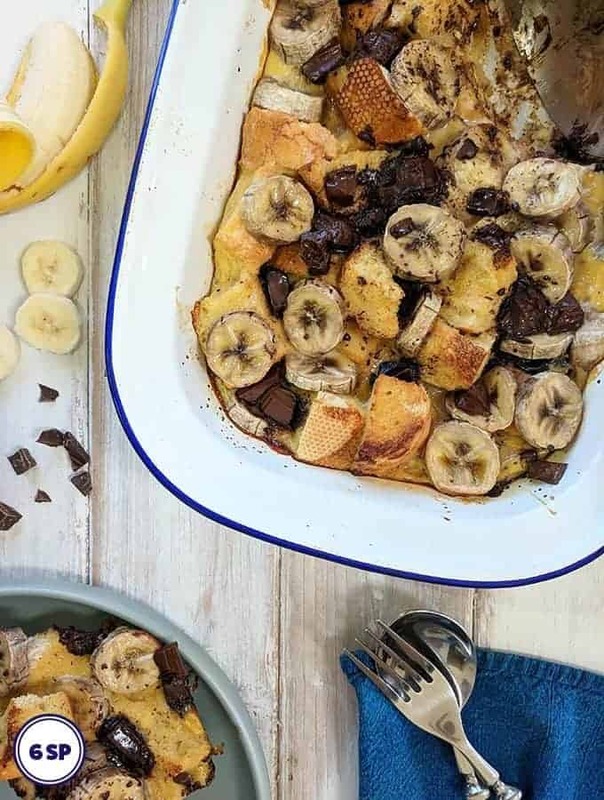 As with a lot of Weight Watcher friendly recipes, when you are only using small amounts of oil to cook with, you run the risk of the ingredients sticking to the bottom of the pan. If it starts to stick, just add a tablespoon or so of water and stir, scraping any browned bits from the bottom of the pan. Add the chopped parsnips to the mixture and stir to combine (pic 3). Add the stock (pic 4) and then the milk and stir. Season well with lots of black pepper (pic 5) before stirring again, placing the lid on the saucepan and bringing to the boil. Simmer for 30 minutes, until the parsnips are soft. I used an immersion blender to blend the soup to a smooth, velvety consistency. 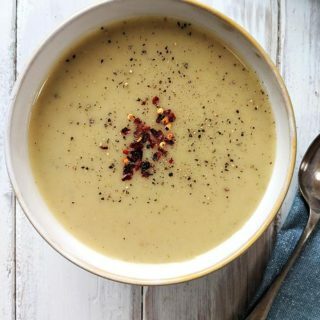 What I used to make this Weight Watchers friendly Soup? I ‘cheated’ and used grated ginger from a jar, available from Amazon, rather than using fresh ginger. I used an immersion blender like this one, available from Amazon, to blend the soup. 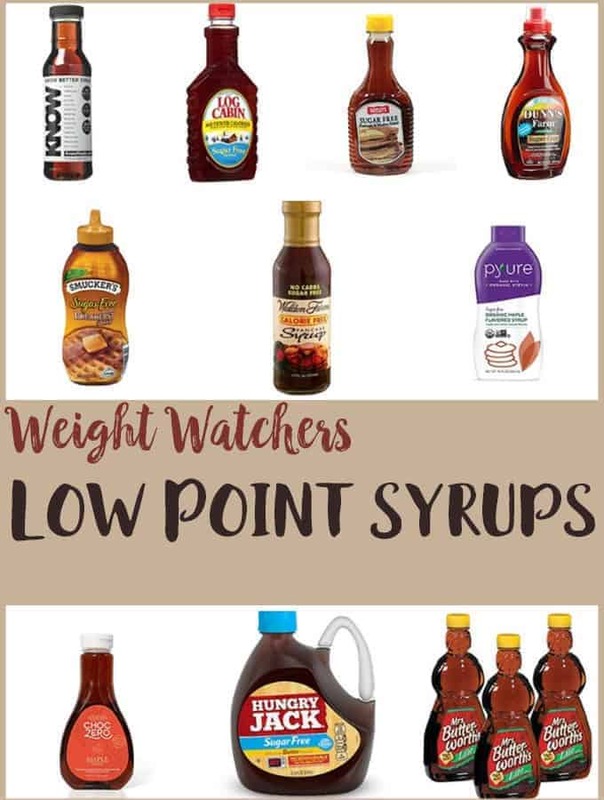 If you are looking for low SmartPoint soups, you may like this 1 SmartPoint Tomato Soup, or this 1 SmartPoint Carrot and Lentil Soup. If you like your soup spicy, how about this Thai Spiced Butternut Squash Soup or this Tom Yum Soup. This filling & tasty soup is just 4 SmartPoints per portion on Weight Watchers Freestyle plan. Heat the onion in a large saucepan over a medium heat. Add the onions, garlic, ginger and garam masala and stir to combine. Cook for 8 - 10 minutes, stirring often to prevent the mixture sticking to the bottom of the pan. If it does start to stick, add a tablespoon of water. Once the onions are soft add the chopped parsnips and stir to coat. Add the stock and the the milk and season well with black pepper. Bring to the boil. Once the mixture comes to the boil, turn down the heat, place the lid on the saucepan and simmer for 30 minutes, stirring occasionally. After 30 minutes the parsnips should be soft. You can check them by piercing them with a knife. If they are cooked through, turn off the heat and use an immersion blender to blend the soup till it is smooth. Taste the soup and add more salt and pepper if needed. Serve sprinkled with red chilli flakes.